What’s the age of the oldest pig piggy bank? And I mean the piggy bank in the shape of a pig. Where is it from, what’s the provenance? The answer to these questions seem easy (look on the internet and there is the answer?) but it is not! My first thought was that the oldest pig piggy bank could be located in China. The circumstances for finding a pig piggy bank in the ages before our time (BC) where okay: the pig was highly regarded as pig as such and as a holy sacrifice animal. Literature shows that in the early ages there were indeed piggy banks made of clay, but not in the shape of a pig. In the Tang Dynasty there were official offering (sacrifice) shrines (blocks) but also individual piggy banks for children. So no oldest piggy bank in the shape of a pig in China. They showed up there centuries later. But if someone can enlighten me, or just say ‘you’re wrong”? Feel free to do so. 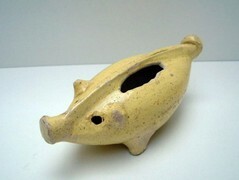 I could not locate the oldest pig piggy bank before our Christian era, not even in China. Honestly: a disappointment. People saved money in other storage places. The date people started to use individual piggy banks is unknown. The ancient Greek used offering blocks with an opening to put small coins in. Even in Pompeï (ancient Italy). It is plausible that the production of individual piggy banks started in the late Middle Ages of our Western Society. 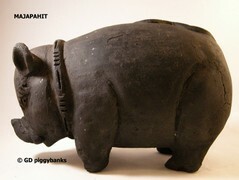 It started with earthenware jars and later on potters formed piggy banks in different animal shapes. The pig piggy bank was introduced around 1600 and in the 18th century it was a common household article. Nevertheless: The pig piggybank is older than our Western examples. For real pigs we have to travel to East Java, to Trowulan in Indonesia. Trowulan is surrounded by an archaeological site of the capital city of the Majapahit Empire from the 14th to the 15th century. Excavations show found evidence of dense population during the 14th to 15th centuries. Terracotta figurines, amongst them piggy banks, were produced in large quantities. The Majapahit piggy banks (not for children!) were used to put coins in as offering to the gods. These very thin bronze Chinese coins were found during excavations in large numbers. So far so good. But was the oldest pig piggy bank only formed in the 14th century? The answer is NO. The genuine oldest pig piggy bank (so far) was found in Billeben (Thüringen, Germany).Researchers conclude that this pig piggy bank from the Middle Ages was produced between the 11th and the 15the century. Nowadays it is stored in the depot of the Museum für Ur- und Frühgeschichte Thüringens in Weimar (Germany). 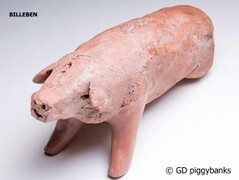 The answer to my ‘quest’: The oldest known pig piggy bank is a German one from ± 1300. Experts doubt this, but there is as far as I know no evidence that this is untrue. The oldest pig piggy bank in my collection dates ± 1750. But I am not sure if that is true, identifying pig piggy banks, and certainly older ones, is not an exact science. To be sure of the age one could use the C14 dating method, but that is too expensive for common piggy banks.